Henderson Harris (right) talks with Jannett Taylor at a Gear Up event for parents in Oklahoma City. Harris, whose daughter attends Douglas High School, and Taylor, who’s granddaughter attends Douglas, are working to increase participants in the school’s Parent-Teacher-Student Association. At John Marshall High School in Oklahoma City, only 22 percent of parents attended a parent-teacher conference in 2012-2013, state records show. In Tulsa, just 4 percent of parents at Central Junior High School made at least one parent-teacher meeting – the lowest rate in the district. At Chandler High School in east central Oklahoma, no parents attended any parent-teacher conferences, giving the school the lowest rate in the state. The small participation in parent-teacher meetings at many Oklahoma schools is evidence that more parents need to become involved in their children’s education, many educators say. Statewide, about seven in 10 parents attended parent-teacher conferences in 2012-2013, the latest school year for which figures are available. That is the only measure of parental involvement tracked by the state’s collector of education data, the Office of Educational Quality and Accountability. In Oklahoma, close to a fifth of schools, or 330, had less than a 50-percent participation rate. Parent-teacher conferences don’t tell the whole story, however. A national study released earlier this year challenged decades of research when it found that many common forms of parental involvement contribute little to students’ academic success. Parent-teacher conferences, parent-teacher-association involvement, volunteering in class and the like made no difference, said the study, which reviewed years of past research. Some forms of parent involvement, such as helping with homework, can do more harm than good, the study said. It added that ineffective efforts were being incentivized by federal funding. Sonia Johnson, director of parent and community engagement for the Oklahoma State Department of Education, downplayed the study’s findings, pointing to decades of research affirming the value of parental involvement. Johnson did agree that traditional models of parental involvement don’t always work. She said schools must do more to create engaging relationships between teachers and families. Low attendance at parent-teacher meetings can be a warning sign, but that doesn’t necessarily mean students are underachieving, school officials say. Oklahoma Watch compared attendance rates with letter grades among more than 1,700 of the state’s public schools and found no consistent correlation: Dozens of schools with A grades had attendance rates below 50 percent and dozens of F schools had more than 50 percent. Johnson said the key to parental involvement is a meaningful relationship between teachers and families. To that end, the education department is working to provide resources to school districts to help them deepen involvement by parents. Some schools also trying new approaches to connect with parents. 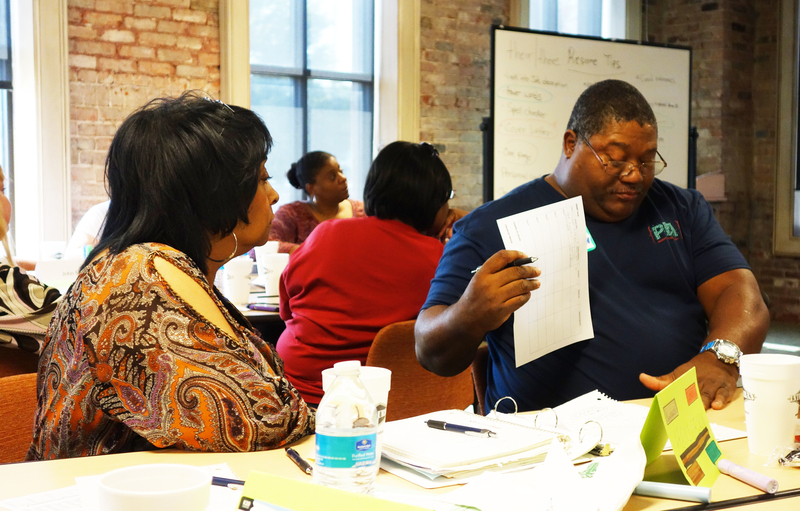 In low-income urban schools, the obstacles to parental involvement are steep. The stresses of poverty, social ills, single-family households and two working parents make it difficult to connect parents with teachers. Johnson said the belief that low-income parents don’t care as much about their children’s education is a myth. All parents, regardless of race or socio-economic status, want to see their children succeed, she said. They just don’t always know the best ways to get involved or help their children. To engage more parents, Oklahoma City Public Schools is using a federal program called Gear Up, whose overall goal is to boost college attendance. Twenty-six percent of the district’s students live below the federal poverty level, and 45 percent of families have only one parent, according to 2012-2013 data from the Office of Educational Quality and Accountability. The district is trying to engage families through efforts such as busing parents to meetings or events, paying for their taxis or parking, reimbursing them for mileage and holding special events, including taking a child to school for the day. 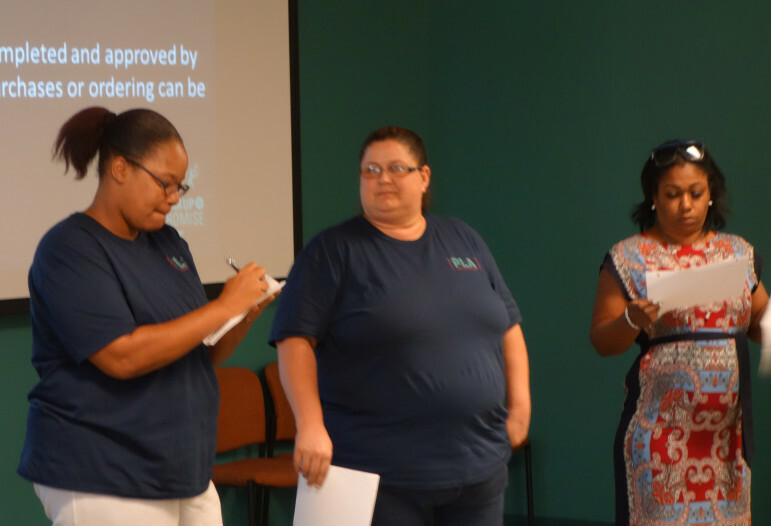 Renea Al-Batati (center) participates in a Gear Up group activity in Oklahoma City. Al-Batati, whose son attends Southeast High School, helps an effort to increase attendance at parent-teacher conferences at the school. Southeast High School parent Renea Al-Batati said she saw how important her involvement was after her son started high school last year. Al-Batati said she had been paying more attention to her work because she thought her son had the study skills to succeed in school. Al-Batati is now volunteering with Gear Up, which asks parents to identify a problem at their school, then work with school officials to draft and implement a solution plan. Al-Batati’s plan is aimed at increasing attendance at parent-teacher conferences. Southeast High School’s attendance rate at such conferences was 72 percent in 2012-2013, slightly above the district’s overall 71 percent. Henderson Harris, whose daughter is a sophomore at Douglass High School, said he has found ways to be involved even if he can’t understand her trigonometry or science homework. That usually means getting her tutoring and having her participate in after-school study sessions. Harris is also working with the Gear Up program, trying to increase membership in Douglass High School’s parent-teacher-student association. School districts nationwide and states are trying new ways to spur more involvement by parents. Tulsa Public Schools, and now the Oklahoma City district, are using a community schools concept to partner with local organizations that focus on academics, social services and health. That includes helping parents learn how to reinforce what their children learn at home. In Wisconsin, the Madison Metropolitan School District has parent liaisons whose job is to help parents connect with their children’s teacher. An Ohio law requires that Cleveland parents meet with their children’s teacher at least once before December, although no penalty is attached. According to the Cleveland Plain Dealer, nearly 16,300 parents have met with their teachers this year, compared with 13,350 last year. In the Oklahoma Panhandle, Yarbrough Public Schools built a mobile classroom inside a school bus meant to help students continue to learn during summer break. The program also grew into an effort to involve parents in their children’s education. Superintendent Jim Wiggin said parents and their children get on the bus and participate together in workshops that include reading and math. Students also take home educational games to play with their parents. Some parents were skeptical at first, but soon they wanted the bus to swing by more frequently, Wiggins said. The bus ran for one month this past summer; the district plans to run it for two months next summer. About $25,000 in grants covered the cost of technology on the bus. Wiggins estimated the district spent less than $10,000 of its own money retrofitting the vehicle, including adding shelves for a small library. Wiggins said the bus helps overcome issues tied to poverty and spotty access to technology, libraries and other services in the 400-square-mile district. According to the study co-authored by Robinson, some things that parents can do that make a difference in their children’s education are reading to them at home, getting them placed in a classroom with a good teacher and talking with them about college plans. Johnson’s office at the state Department of Education offers other tips: communicating with teachers; talking daily with children about homework and activities; modeling the value of learning; establishing a daily family routine, and monitoring out-of-school activities. Harris, the parent from Douglass High School, said even busy parents must find the time to be involved.